BETHLEHEM TOWNSHIP, Pa. — President Donald Trump doesn’t need to worry that special counsel Robert Mueller is going to bring him down. No, if anyone removes Trump from office it seems increasingly likely it’ll be the normal way, at the ballot box. And because of people like Donald Wright Jr., 71, a self-described independent who had long pined for a businessman in the Oval Office. Philly votes for elections officials this year. Here’s what advocates want candidates to talk about. “I’d write in Big Bird first before I voted for Trump. No way I could ever vote for him,” said Wright, who works in consulting and analytics and voted for Hillary Clinton. A longtime registered Republican, Wright said he was driven from the party by Trump, changing his registration to Democrat in 2017 after giving the president a shot as leader of the country — and determining that Trump cared only about his political base, not the rest of the country. Wright lives in the tree-lined suburbs of Bethlehem Township, Northampton County, in the Lehigh Valley, a key swing region of Pennsylvania at a time when the Philadelphia suburbs are getting bluer and rural Pennsylvania is growing redder. The county was one of three in the state where a majority of voters went twice for Barack Obama then swung to Donald Trump in 2016. But in the two years since, Democrats up and down the ballot have trounced the GOP in Northampton. It’s not Trump Country. But in a state the president won by less than 1 percent of the vote, it serves as a bellwether for the fragile coalition of Pennsylvania voters that came together three years ago and will need to be pieced together if Trump hopes to carry it again. In 2016, that meant strong support in rural, traditionally Republican parts of the state, big gains among white, working-class areas that traditionally voted for Democrats, and enough support from other Republicans in suburbs and elsewhere who wouldn’t vote for Clinton. Democrats see opportunity here, too. Clinton’s losses in the so-called blue wall of Pennsylvania, Wisconsin, and Michigan cost her the White House, and Democrats vying for their party’s nomination in 2020 are expressing renewed commitment there. 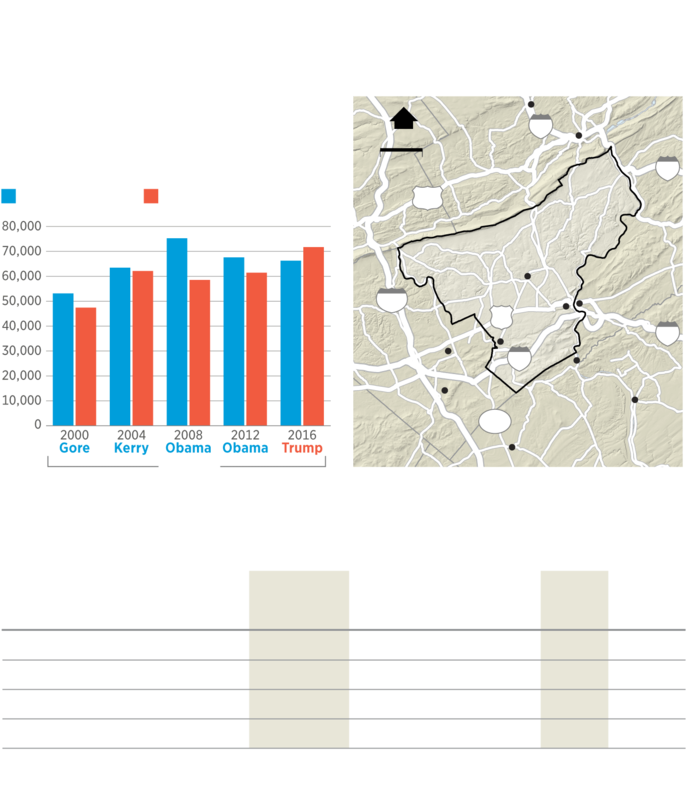 Unlike Luzerne in the Northeast or Erie in the Northwest — the two other longtime Democratic bastions, both former industrial areas that have suffered economic dislocation and decline, that flipped to Trump — Northampton is one of the few areas where Trump performed well in Pennsylvania in 2016 where the population is actually growing. That gives him a chance to expand his base of support, if he can — or for Democrats to win voters and take back the White House. Democrats thumped the GOP in local races in 2017, and Gov. Tom Wolf and Sen. Bob Casey carried the county by double-digit margins last year. Susan Wild, also a Democrat, won an open House seat comfortably in a newly drawn congressional district, parts of which had been represented by a moderate Republican who opposed Trump. Solidly red, rural areas remain firmly in Trump’s column, and the suburbs have continued to shift steadily to the left. That puts the spotlight on a handful of counties where turnout can swing the overall election, such as Erie, Luzerne, and Lackawanna. Northampton County is also key to Trump’s coalition, but it differs from the others in some important ways. Adjacent to Allentown, Pennsylvania’s third-largest city, Northampton is about a 90-minute drive north of Philadelphia and shares the same media market, meaning residents see similar news, ads, and other programming as Philly and its collar counties. Even as those industries declined, the local economy was buttressed by anchors such as the county’s three universities, medical institutions such as the Lehigh Valley Health Network, Sands Casino on the site of the Bethlehem Steel plant, and Easton-based Crayola. While the population has declined in other parts of the state that swung heavily to Trump, Northampton has seen steady growth, according to the Census Bureau. Median household income is also higher in Northampton County than in other swing counties, and a greater share of adults 25 or older have bachelor’s degrees — demographics that tend to align with Democrats. The Lehigh Valley county was one of three counties in the state that switched from Democratic to Republican between the 2012 and 2016 presidential elections. 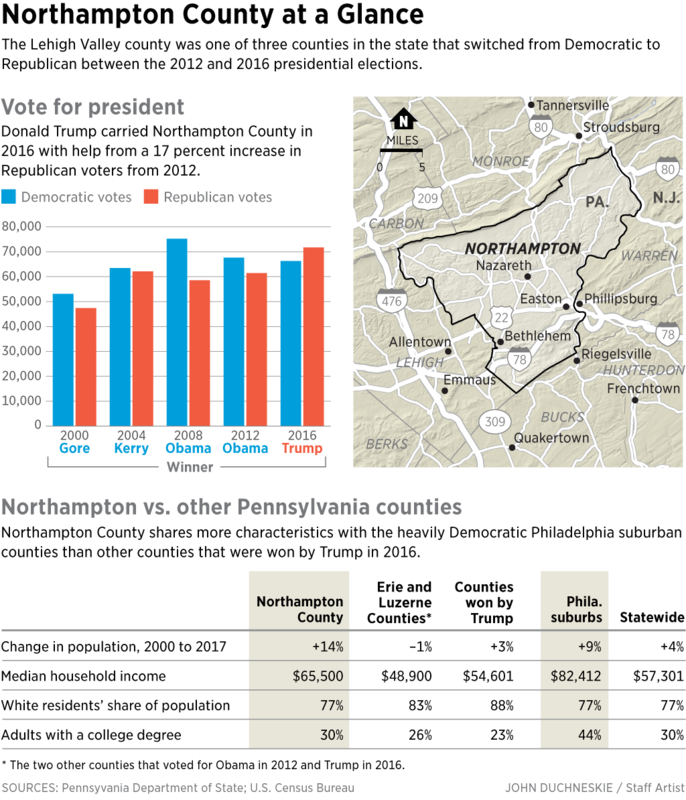 Donald Trump carried Northampton County in 2016 with help from a 17 percent increase in Republican voters from 2012. Northampton County shares more characteristics with the heavily Democratic Philadelphia suburban counties than other counties that were won by Trump in 2016. * The two other counties that voted for Obama in 2012 and Trump in 2016. There’s another important political characteristic about Northampton County: The Democratic vote tends to be stable, with victory determined by fluctuating turnout on the Republican side. That suggests its margins are determined less by individual swing voters than by Republican-leaning voters who sometimes show up, as they did for Trump, and other times do not vote. Enough showed up that Trump carried Northampton by about 5,464 votes in 2016, four years after Obama won it by 6,160 votes. Still, that’s a smaller shift than in many other counties in the state, including Erie and Luzerne. Trump won the state by 44,292 votes. Interviews with more than a dozen voters here show a mix of opinions: Some who have supported previous GOP presidential nominees say Trump has done nothing to bring them into his camp, while others weren’t enthusiastic about Trump but voted for him anyway — and are now fully behind the president. Still others happily voted for him and are standing by him. A cement plant rises above a cornfield in Nazareth, Pa. Northampton County was at the center of the cement industry in the U.S.
Down the road from one of the few remaining cement plants, on Route 248 in Nazareth, Bonnie Bowe, 72, was sitting at the Nazareth Diner talking politics with her friend Nancy Cramer, 79. Her husband is suffering from advanced kidney failure, Bowe said, and they don’t have much. Bowe added that she was disappointed by Obama, for whom she voted in 2008, but found today’s Democrats even less impressive. “I don’t deal with this equality-for-all crap,” she said, singling out freshman Rep. Alexandria Ocasio-Cortez, the progressive New York Democrat. Frank Anderson, a 54-year-old construction worker, said that his household delivered four votes for Trump in 2016 and that he plans to support him again. “I’m hoping we’re done with the collusion investigation,” he said outside his pickup truck as he left a job site in downtown Bethlehem, about 20 minutes south of Nazareth. Anderson, of Palmer Township, credited Trump with building up the military and said he’d like to see Trump “straighten out health care,” but not get rid of the Affordable Care Act until he has a viable replacement. Frank Anderson, a 54-year-old construction worker from Northampton County, said he voted for President Trump and continues to support him. “I’m hoping we’re done with the collusion investigation," he said. While Trump retains solid support in some corners here, it’s unclear whether he’s done anything to expand upon it. The latest sign of trouble for Trump: In a special election on Tuesday, a Democrat flipped a GOP-held state Senate seat in the Pittsburgh suburbs, where Trump won the local congressional district by nearly 20 percentage points. Pam Iovino’s win followed a similar victory for Democrats last year by Rep. Conor Lamb. 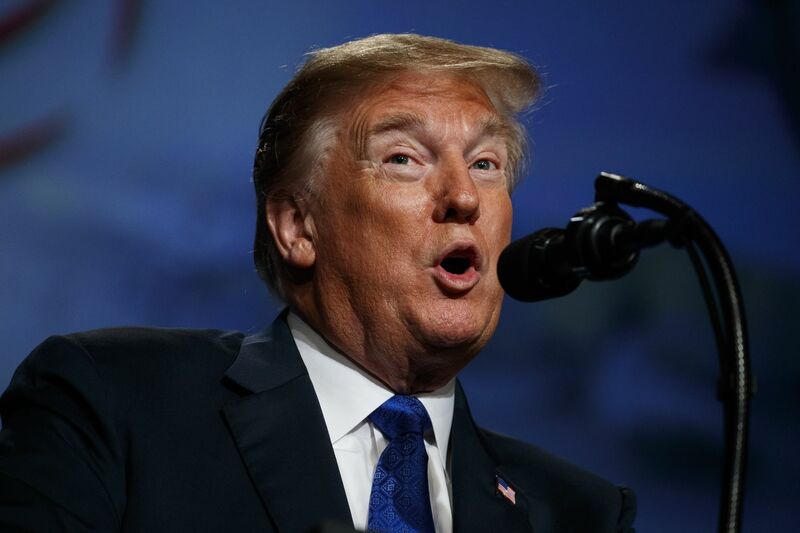 What’s more, 61 percent of registered voters across Pennsylvania say they have an unfavorable view of Trump, while just 38 percent report a favorable view, according to the latest Franklin & Marshall poll. It’s still early. There are no visible signs of the looming presidential election yet — no offices or lawn signs — and Pennsylvania’s late primary means it probably won’t get a lot of attention from the candidates for a year or so. There were clues inside Dubs on 5th Sports Bar in West Easton, near the Lehigh River. Sitting at the bar was Chris Joseph, 48, a grounds supervisor who said he didn’t vote for either major-party candidate in 2016 — he “might have” written in his buddy’s name. “I definitely didn’t like Hillary,” he said, adding that he credited Trump for a growing economy.